A 320-page pictorial of the final years of smoking action on America's last steam powered railway, the Norfolk & Western (1945-1960). A study of guts, grime and power as everything from small consolidations and Mallets to husky double-headed 2-8-8-2s moved coal trains to Tidewater and the Midwest. This was Steam's Last Stand. A nice selection of black and white photographs of Norfolk & Western steam locomotives taken by the author, Mallory Hope Ferrell, and others. Includes captions and some text. Good photograph reproduction. Also includes HO Scale drawings of Class A, Class Y3, Class J, Class S1 and S1a locomotives. 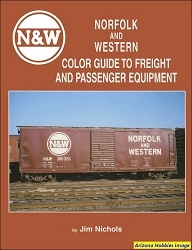 A color photo section on excursion steam completes this book. Epilogue: Encounter With An Old Friend, pp. 314-320. Hundman Publishing, hardcover with jacket, 322 pages, 8.5 x 11 x 1 in., B&W photographs with captions; text; locomotive drawings; color photo section on steam excursions.